These reddish-brown nocturnal creatures feed primarily on decaying organic matter or other insects, hiding in dark, damp places during the day. They are found throughout the United States, and when their populations are high, they may cause damage in the garden by feeding on a variety of plants such as lettuce, corn, celery, tender young seedlings, and blossoms and ripening fruits. This photo shows the damage an earwig can cause on a daylily bloom. 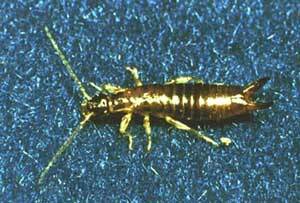 If earwigs are a problem in your garden, trap and destroy them. One method is to fill a flowerpot with crumpled paper, then place it upside down in the garden with a stick to prop it slightly off the ground. During the day earwigs will crawl into the paper to hide, at which point you can collect them.